When I started this blog about a year ago, I had the ambitious goal of writing about the impact of technology on journalism and vice versa. The internet, globalization, satellite and cable news channels are dramatically changing the way people receive their news. They’re also changing the way we as news producers need to think about our jobs, our audience, and many other factors. But it turns out I’ve just been far too busy to spend a lot of time thinking deep thoughts about the future of news delivery. Fortunately, my good friend Carrie Brown has thought about little else for the last few years. And she’s finally decided to share some of her thoughts with the world via a new blog: The Changing Newsroom. Carrie will be teaching journalism at the University of Memphis this fall, and she’s currently finishing up her Ph.D work at the University of Missouri. She’s also worked for the Committee of Concerned Journalists and even managed to squeeze in a bit of time as a working print journalist before she started her career as a deep thinker. 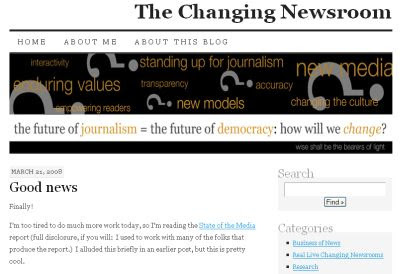 If you’re at all interested in the business of journalism, I recommend checking her blog out.